Laurey Bikes: Oh blessed rest! We had no internet last night so we all had to TALK to each other! Imagine that! Actually, it's nice to have that every once in awhile, though I am as hooked as you. But it was also nice, yesterday, to have a low mileage day, a day of less wind, not-too-bad road surface, all of that. 111miles wipes a person out! I did ride yesterday. And I rode today too. Thankfully, these two days' mileages have been low, 50 miles or less. Funny, that amount of mileage used to make me take a deep breath, plan, get psyched. No more. 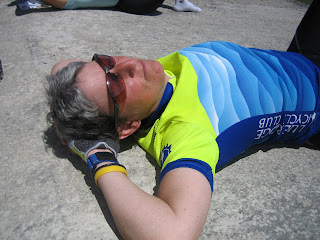 50 miles is a "rest day." Ha! We are in Campwood, Texas now. Seems that we have left West Texas and are now in Hill Country. Our elevation is considerably lower and we are now seeing lots of green. I'm not sure, but I might have seen a hint of blue, as in Bluebonnets. I don't know when they bloom, so I don't know if I am making that up. Today's ride was easy. 50 easy miles. Oof. Tomorrow we head into the hills in a big way, but today, right now, we are stopped in Campwood and that, my friends, is just fine with me. I guess the biggest thing I can say about the BIG day was that I was SO sore and SO tired and SO spent when it was over. I sank into a chair, allowed someone to bring me a drink, a piece of pizza, a hug. I let someone take my bike. Someone else gave me my key. Someone had taken my bags to my room. Along with Jan I was the last one to finish - well, of the 6 of us who rode the whole way that day I we were the last to come in. And I was DONE. But remarkably, the next morning I got up, got dressed, ate breakfast, got on my bike, and rode on. This is a testament to something beyond me. Good trainers. good food, good advice, good luck charms, the knowledge that many people are keeping their fingers crossed for me, sending me love, believing that I can do this. And now, tra la, I am believing it too. It is not over. We are only half way through that number of days on this ride. But I keep riding and my body keeps working and my bike keeps working and there we go. What a time. What a thing to do. What a life. Thanks for caring about this with me. this is from Jan's friend Judi in Phoenix I am glad to be reading about the adventures and good going on the 111 mile ride. Jan would not let you fall behind and you both finished! I just keep wondering what you all are going to do when this wonderful journey ends - just keep riding! Laurey, this day reminds me of my first Century ride, when I was new to cycling. My partner and I were the last ones across the finish line; everyone else was there, rested, and eating lasagne. But they stood up and applauded us when we came across the line! I'll never forget it; we didn't give up! So glad you didn't either!